Wow! Look At What This Puppy Swallowed! 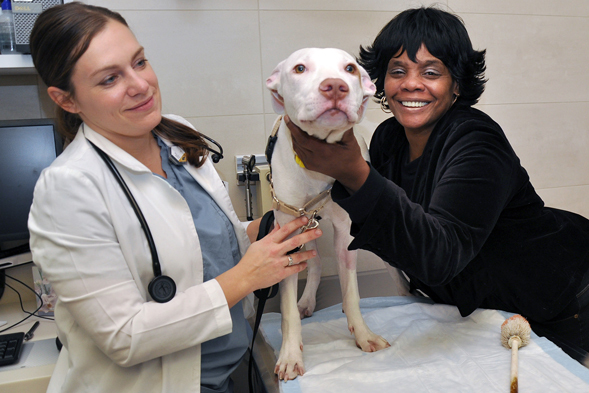 Charesse W. calls her five-month old pit bull mix, Petey, her “miracle dog” for good reason. On Christmas Day, Charesse left her Brooklyn apartment to spend time with family. Petey stayed behind, and when Charesse returned a few hours later, nothing seemed amiss. In the days that followed, however, Petey grew very sick. He stopped eating and drinking, and his weight declined rapidly. Charesse rushed Petey to the ASPCA Animal Hospital, where he received care through the ASPCA’s Trooper Fund—a program in place to cover medical costs for animals whose guardians need assistance with veterinary expenses. Veterinarian Dr. Juline Holland noted that Petey was severely dehydrated and thin, and she could feel a tubular object extending the length of his abdomen. She stabilized Petey before sending him to radiology, where she was shocked by his radiographs. This small pup had swallowed something strange. Doctors and nurses gathered around the X-ray, studying a long, thin object that extended almost the entire length of Petey’s body. Petey needed emergency surgery—foreign objects, especially one so large, can cause severe damage to the throat, stomach or intestines if swallowed. The resulting complications can be fatal. 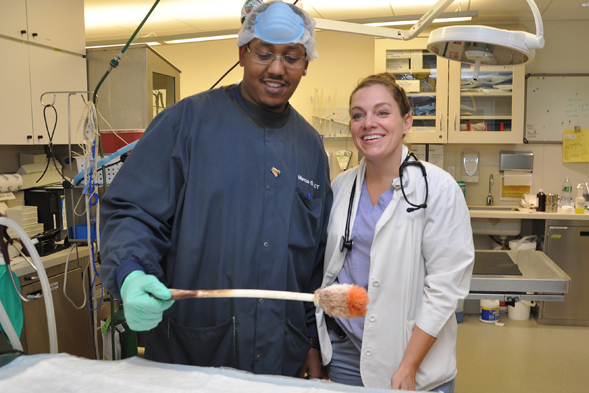 Dr. Yvonne Kline, along with Dr. Marisa Altieri, performed surgery on Petey, and what they found in his the abdominal cavity was astounding. It turned out to be a toilet brush, approximately 15 inches long! The brush end was stuck in Petey’s esophagus, while the handle stretched his stomach to several times its normal length. The doctors considered pushing the brush from Petey’s stomach, but it was lodged tightly in his throat. The only other option was to make a small incision into the stomach and extract it. They did so, and gently removed the brush. “It was the one of the most remarkable things I have ever seen in veterinary medicine and the strangest surgery I have ever performed,” Dr. Kline says. The next day, Petey was eating again, and staff noticed how affectionate he was. Petey is taking medicine to relieve gagging symptoms and eating multiple meals a day to gain weight. After days and sleepless nights spent worrying about Petey, Charesse was immensely relieved. Her “miracle dog” is working on one important New Year’s resolution: not to swallow anything larger than dog kibble, or maybe the occasional treat! TPLO, or tibial-plateau-leveling osteotomy, is a surgery performed on dogs to stabilize the stifle joint after ruptures of the cranial cruciate ligament (analogous to the anterior cruciate ligament [ACL] in humans, and sometimes colloquially called the same). If your dog needs a acl repair, call us today to schedule a surgery consult with Dr.Salas! He’ll go over the surgical procedure, an outline of the care needed at home post-op and answer any questions or concerns you may have! 1. Female pets will have longer, healthier life expectancy. Spaying helps prevent uterine infections and breast cancer, which is fatal in about 50 percent of dogs and 90 percent of cats. Spaying your pet before her first heat offers the best protection from these diseases. 2. Neutering provides major health benefits for you male pets. Besides preventing unwanted litters, neutering your mail companion pet prevents testicular cancer, if done before six months of age. 3. Your spayed female won’t go into heat. While cycles can vary, female felines usually go into heat four to five days every three weeks during breeding season. In an effort to advertise for mates, they will yowl and urinate more frequently – sometimes all over the house. Why does a dog or cat need pet dental x-rays for their veterinary dental cleanings or exams? It’s really very simple, the visible part of a tooth is only a small portion of the structure of the teeth and mouth. So, just as your dentist will take dental radiographs or x-rays to so what’s happening below the gumline, the same holds true for a vet dentist. What Is Spaying and Neutering? Spaying and neutering are surgical procedures performed by veterinarians that render dogs incapable of breeding by removing their reproductive organs. When a female dog is spayed (also called an ovariohysterectomy), the ovaries, fallopian tubes and uterus are removed. Neutering commonly refers to the castration of males and the complete removal of their testicles. Spayed dogs are less likely to develop breast cancer and will not be at risk for ovarian or uterine tumors. Neutered male dogs will not get testicular cancer and they will have a decreased chance of developing prostate enlargement. By neutering male dogs, you lessen their desire to roam, thus decreasing their risk for injury and transmission of infectious disease. What Are Some Behavioral Issues Associated with Dogs Who Aren’t Spayed or Neutered? Both male and female dogs will show general behavior signs such as howling, barking and urine marking. There is also a strong need to roam and find a mate, often leading to fighting. When Is the Best Time to Spay or Neuter My Dog? It is generally considered safe for puppies as young as eight weeks of age to be spayed or neutered. In animal shelters, surgery is often performed at this age so that puppies can be sterilized prior to adoption. In an effort to avoid the start of urine marking in male dogs and eliminate the chance of pregnancy, it’s advisable to schedule the surgery before your dog reaches six months of age. It’s possible to spay a female dog while she’s in heat, but not always recommended since she may be susceptible to increased blood loss. Though older dogs can be good candidates for sterilization surgery, your vet can best determine if the procedure can safely be performed. Please check with your veterinarian about the best time to spay or neuter your pet. What Happens When My Dog Is Spayed or Neutered? Will He or She Act Differently? After sterilization, your dog may be less likely to exhibit certain behaviors, but his or her personality will not change. Spayed and neutered dogs may be predisposed to weight gain, but proper body condition can be maintained with appropriate diet and exercise. Your vet can help you chose a proper diet for your dog. Your veterinary clinic will provide pre-surgical advice for you to follow. In general, you should avoid giving your dog any food after midnight the night before surgery. A puppy, however, needs adequate nutrition, and your veterinarian may advise that food not be withheld. Water should generally not be withheld from any canine patient prior to sterilization surgery. What Is the Recovery Process for Recently Spayed or Neutered Dogs? Provide your dog with a quiet place to recover indoors and away from other animals. Prevent your dog from running and jumping for the first few days following surgery. Discourage your dog from licking the incision site, which may cause infection, by distracting your pet with treats or by using an Elizabethan collar. Avoid bathing your dog for at least ten days after surgery.